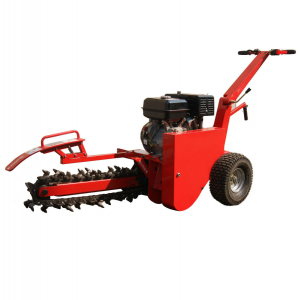 This easy to use trencher is operator propelled to offer controlled digging. You will find it digs straight to the exact depth with an absolute minimum of effort. Very popular with the NBN Contractors due to its witdh (610 mm) it canfit through narrow gates and doorways and trenches close to walls andfences. Suitable for a wide variety of ground, including sand, lawn, clay,gravel, road base and can really get into those 'nooks' and 'Crannies'. The side cleaning auger stops material falling back into the trench.This saves precious clean up time, important for contractors who wantto move onto the next job as soon as possible. The Groundhog uses a Bullet Tooth chain with replaceable carbide-tippedbits and will dig a 3" (75 mm) wide trench to depths of 6", 8" &12" (160, 200 & 300 mm) easily and quickly. 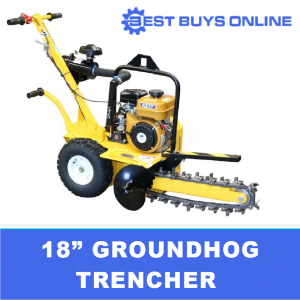 The Groundhog trencher also comes equipped with a rollers that will significantly increased the life of the trencher digging chain while decreasing the risk of chain breaks. The chain rollers ride on the centre wheel of the roller while the side plates of the chain are guided by the wheel shoulders. In testing, sprocket jamming situations that would normally cause chain breaks were eliminated when using the roller.